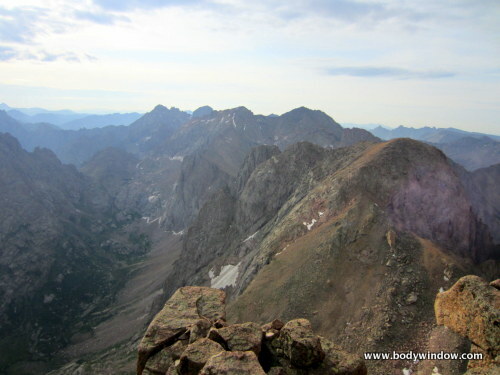 Pigeon Peak and Turret Peak Trip Report ~ Centennial Peaks Number 98 and 99! Completing Pigeon Peak and Turret Peak leaves only one more to go in our Centennial Peaks mountain climbing adventures. We chose the most expedient approach to these peaks, via the North Pigeon Creek, on a fine 4th of July weekend. 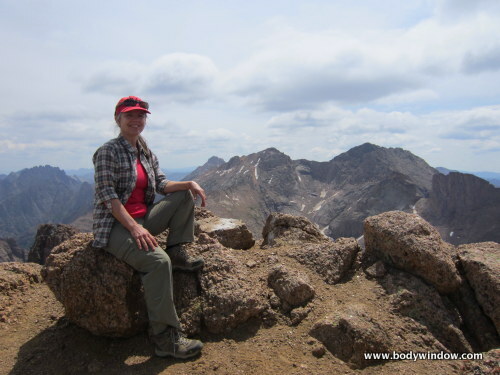 Our summit adventure on Pigeon Peak, at 13,972 feet and Turret Peak, at 13,835 feet, began by driving from Denver to the train station in Silverton, Colorado. 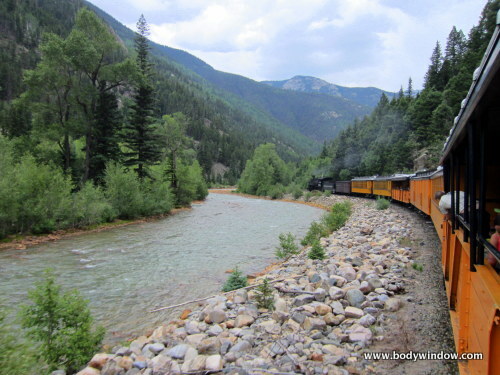 The short, one hour train ride to the Needleton trailhead, where we got off, runs along the Animas River. The scenery is stunning and worth the 90 bucks each that we had to pay for the round-trip, to shorten our hike considerably. The narrow gauge railway runs from Durango to Silverton, but there is no price break to only do 1/3 of the train ride. We were able to take advantage of a backpacker special, to reduce the cost, but these tickets had to be booked early in the spring. Also as of 2013, you had to ride from Silverton as your only option for this special. 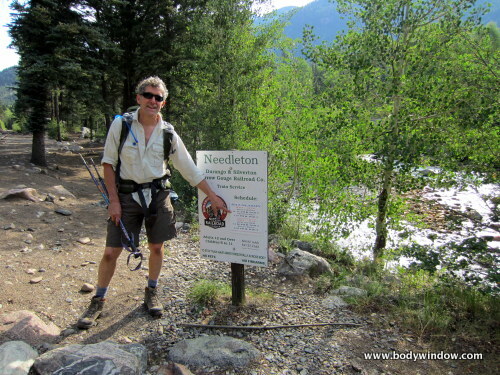 We arrived at the Needleton Trailhead, at 8,200 feet, along with many other backpackers. 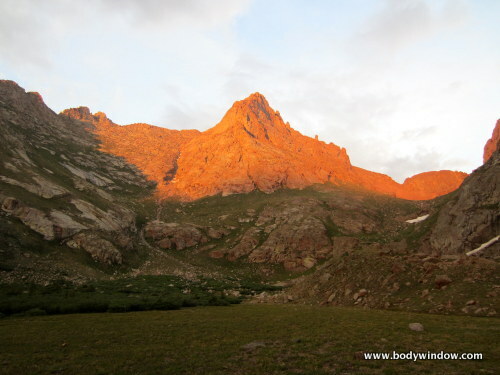 All of them were heading up to Chicago Basin to the three fourteeners, Windom Peak, Sunlight Peak and Mt. Eolus. We had done those mountains, many years ago. 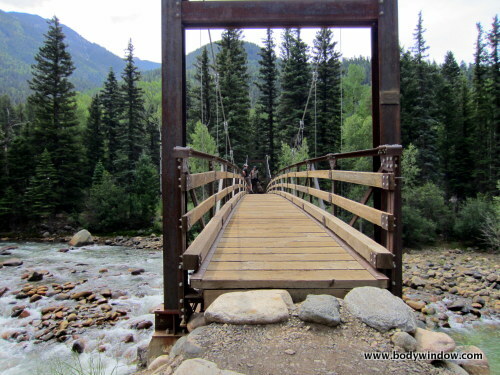 Immediately after crossing the Animas River via the suspension bridge, the North Pigeon Creek and Ruby Creek approaches turn left, along the Animas River Trail as it heads north and follows the river. Rich, my husband, and I were the only ones heading in this direction! I was thrilled that maybe we would have Pigeon Peak and Turret Peak all to ourselves. We used Gerry Roach's guide, Colorado's Thirteeners and I found his descriptions to be dead on - except for the mileage. I suppose he wrote this book long before the accuracy of the GPS. His mileage estimates are always under my GPS mileage figures. After taking the North turn onto the Animas River Trail, you pass several private cabins. Soon you cross Pigeon Creek, and an old rail car on your right. In about three tenths of a mile you come to an open meadow. Roach calls this the "Camper's Meadow." Make sure you look sharp in the meadow, to your right. You will see a faint trail to your right that becomes a very strong trail in the trees, to the east. Follow this trail. This is the Ruby Creek Trail. It heads north for several hundred more yards to a higher meadow that Roach calls the "Upper Camper's Meadow." Continue through and past this meadow on the strong trail as it turns southward, then eastward through the trees as it begins to climb. 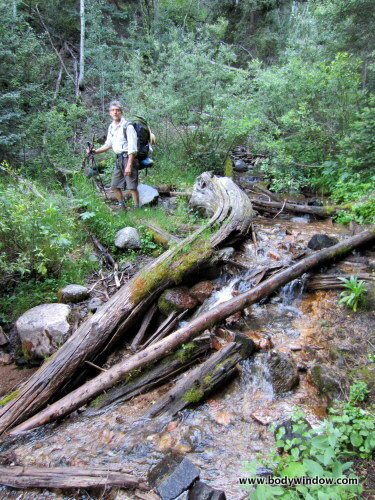 Gerry Roach says the Ruby Creek Trail is hard to find, but we did not think so. 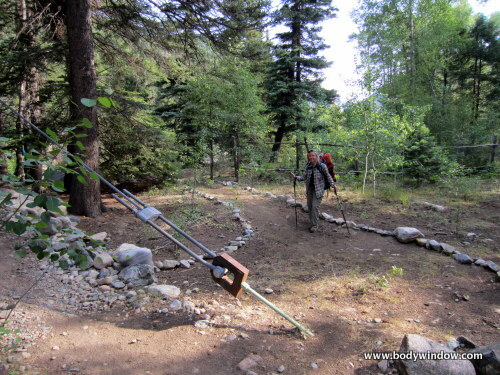 Just make sure you head east in the lower camper's meadow, leaving the Animas River Trail. There is a cairn at the edge of the meadow to guide you. 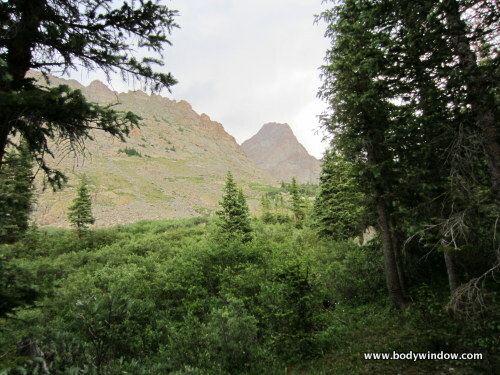 As you leave both meadows, the Ruby Creek Trail soon climbs steeply to the northeast, to what Roach calls the "rounded ridge" at about 9200 feet and at 1.15 miles. This felt longer than a mile to me, because above the meadows the trail is very steep and every turn looks like the "rounded ridge." With a heavy pack, it seemed like forever, climbing to this shoulder. 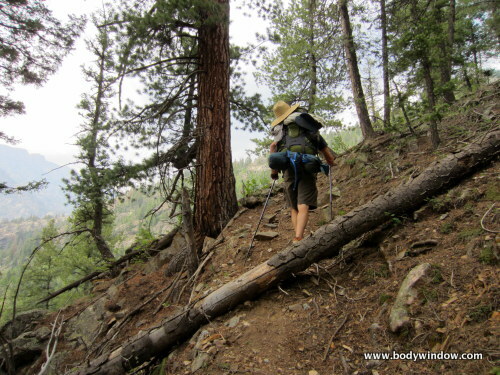 After reaching the rounded ridge, the trail climbs another 300 feet to 9500 feet, before dropping down into the North Pigeon Creek drainage at 1.43 miles. Cross the creek here. Notice a stronger trail veering off to the northwest (left). This is not your trail. 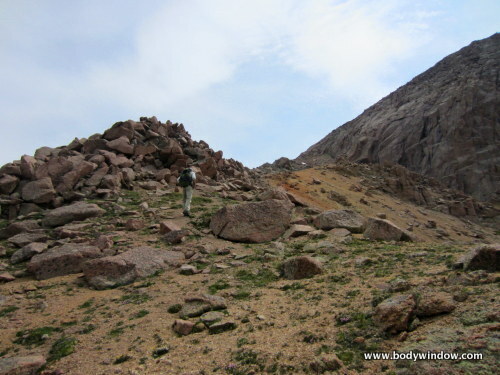 Instead take the brutally steep trail straight ahead and to the northeast. 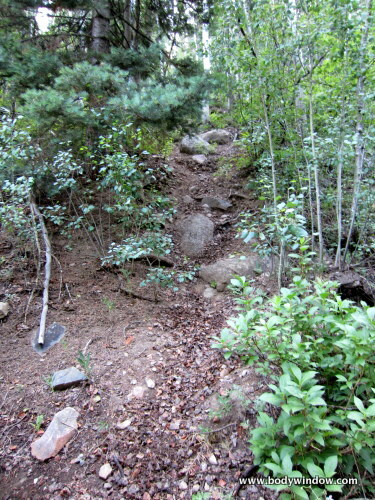 If it has rained recently, this trail becomes a muddy slide. Fortunately, we found it dry. I would have no idea how we would do it in the mud with heavy packs. 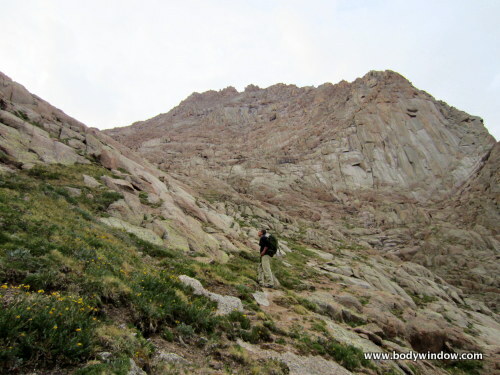 This steep trail follows another small ridge, and is easy to follow. At about 1.63 miles and 9800 feet you reach yet another trail junction. 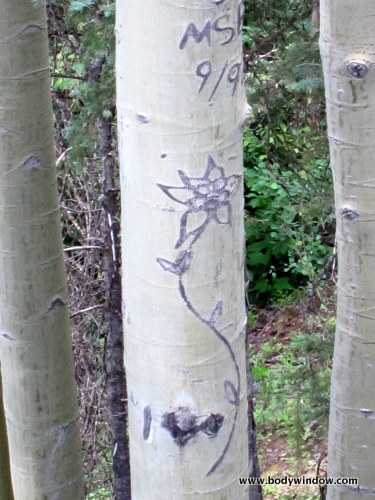 Look to your left and you will see a Columbine carved into a aspen tree. 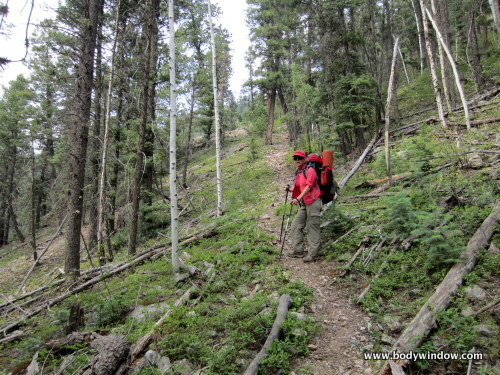 This is the continuation of the Ruby Creek Trail. This is NOT the way you want to go, if you are continuing on via the North Pigeon Creek approach. The North Pigeon Creek Trail continues up the small ridge to your right, is very faint here, and slowly fades out. If you are lucky you will see cairns along the way from here. 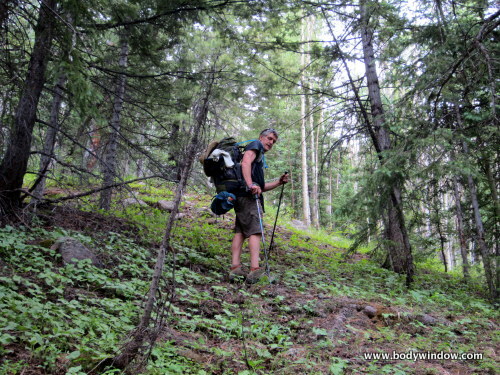 The way now is a bushwhacking, route-finding adventure. It will be necessary to consult your GPS or your topo map frequently, to ensure that you are going the right way. You have 1.5 more miles to go, and all of it is up, up, up, all the while heading east-southeast. 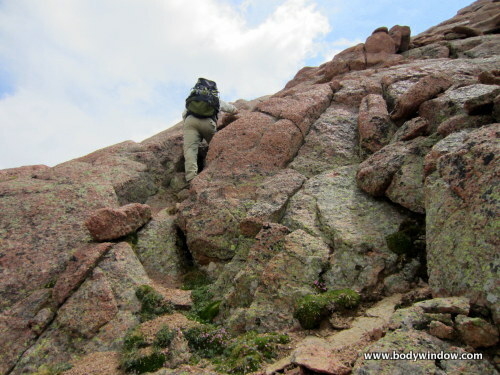 My legs began to get really weary with the heavy load of my pack, as we did a very steep ascending traverse across ridge after ridge. All the while, there is a steep drop off to your right (southwest). Take care not to drop too low, but make sure you are always ascending on this long, steep traverse. Finally, at about 2.5 miles and just above 11,000 feet, you approach a strong stream, which is the North Pigeon Creek, once again. Do NOT cross the stream, but stay on the north side of it. A high ridge appears to your right, south of the creek. A faint trail trail will lead you along the creek. 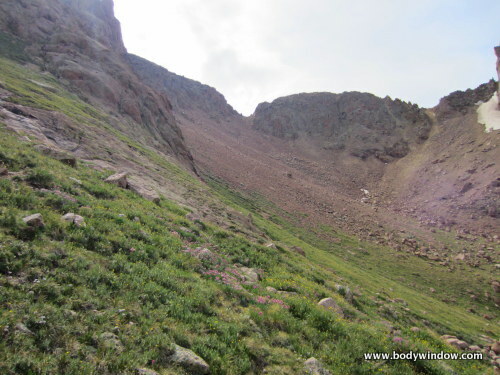 This faint climbers trail then turns more easterly as it takes its final climb through the trees, to tree-line and an idyllic meadow at 11,740 feet. You can catch your first glimpses of Pigeon Peak, through the trees, soaring above you. This meadow, under Pigeon Peak, is worth the effort to get here. It took us a full four hours and 15 minutes to reach this point, 3.14 miles from the Needleton Trailhead, with an elevation gain of 3700 feet. The climb and bushwhack with a heavy pack, extracted a toll from us, as we strolled across the meadow, just before dark to set up camp. We were so very lucky to have clear skies all day, and evening, in these very temperamental San Juan mountains! On day two we rose early and at first light we walked to the far end of the high meadow and headed up the grassy southwestern slopes. There is no trail here, but the route is obvious as you pick your way up the grassy benches. Pigeon Peak is on your right (south) shoulder at all times. If you look at the very first picture again, on this page, the view of Pigeon is from the high meadow where you will camp. 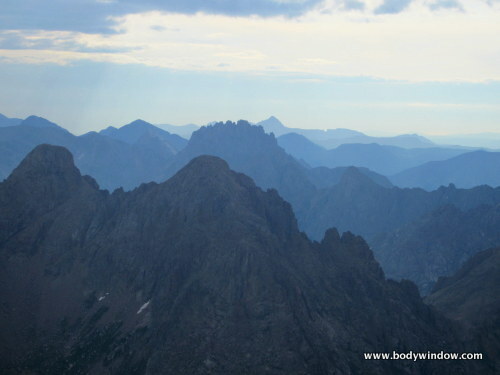 Pick your line between the northwest ridge on your left, and the southwest ridge on your right. You will have to skirt lower cliff bands, but the way is easy. 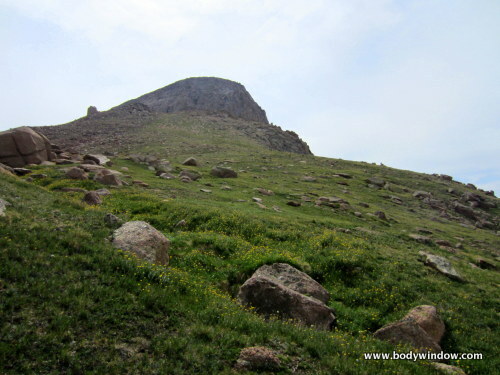 As we climbed higher on the grassy slopes, we started to trend more to the right (south) as Pigeon loomed above. The look back down the mountain, to the high meadow was stunning! You can't even see our little yellow tent, below, even though it is less than one mile away! As the sun hit the ridges, it was a most beautiful sight! When the grass runs out, in the picture below, you encounter a gully just under the lofty ramparts of Pigeon Peak. The way to go is up, and to the left, on the path of least resistance, to just below the cliffs on the left side of this picture. You really are almost there! As you climb up this gully as far as you can go, you will look for what Gerry Roach calls a "blocky weakness" in the cliffs. In this photo, below, it was obvious to us, the way, in the slot just below this small snow patch. Up until now, there was nothing difficult at all about this mountain climbing! Here is my husband, Rich heading into this slot, towards the summit. Just above the small patch of snow (a small remnant in early July) was the 4th class crux move. It is hard to see the perspective here in this picture, below, but some hand-over-foot scrambling was necessary. Nothing very difficult at all. Here is Rich, on the crux move, from above, giving you perhaps, a bit more perspective. I always go first, so he can give my behind a shove if I need it! Just above the 4th class crux move, I thought this was a forth class crack as well. It took some pondering to make it through - using handholds and foot holds. Maybe you would think it is a class 3 move. I suppose it all depends on your wing span. 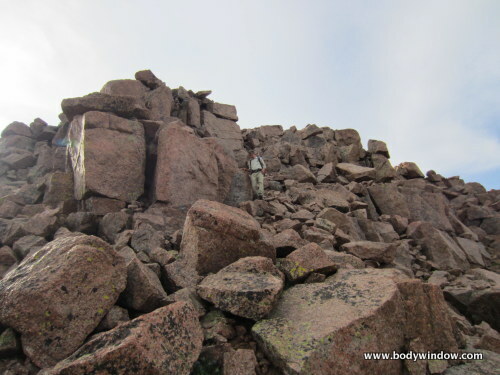 Here is Rich coming down the summit, but the picture shows you the final summit block. 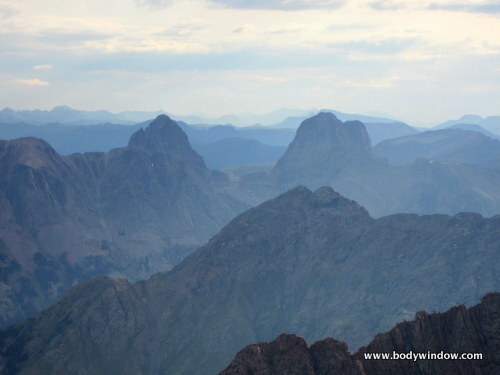 The triangular rock at the top of the picture is the ultimate summit! Yeah, here we are on the summit. The rock at the top is interesting and Rich chose a balancing pose! Number 98, Centennial Peak accomplished! Elle on the Summit of Pigeon Peak! Rich on the Summit of Pigeon Peak! The views were fantastic! The Spirit of the San Juans! Here and to the east, (picture below) is Turret Peak, in the foreground to the right. This peak was our next destination! In the background are the famous fourteeners, Windom Peak, Jupiter Mountain (a Centennial peak and thirteener), Sunlight Peak and Mt. Eolus. In this picture below is Arrow Peak (left) and Vestal Peak (right), from the Summit of Pigeon Peak, looking to the north. 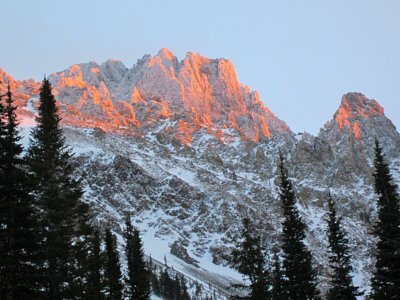 Vestal Peak is another Centennial Peak, that we had climbed the year before. From left to right: Peak Thirteen and Monitor Peak in foreground, Jagged Mountain, middle ground, and Rio Grande Pyramid, background as seen from summit of Pigeon Peak, looking northeast. 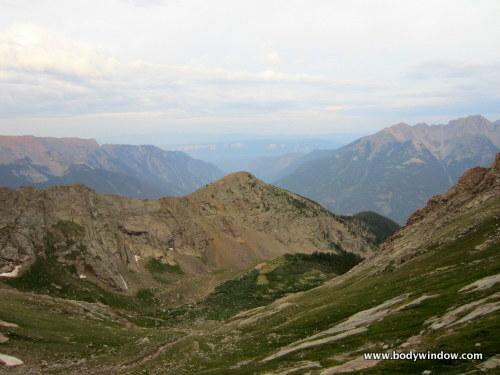 Both Jagged Mountain and Rio Grande Pyramid are high thirteeners and Centennial peaks, which we have also climbed. From the high meadow where we camped, it took us only one hour and twenty minutes to go the 1.3 miles and 2232 feet to the summit of Pigeon Peak. 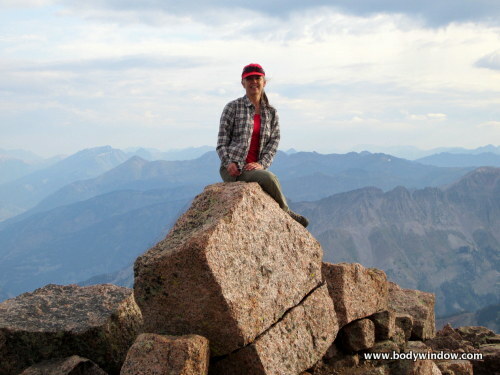 We were on the summit by 7:45 a.m. and no storms were in sight, so we relaxed and enjoyed the view for a half an hour. Our descent off the summit went quickly. We dropped down into the grassy slopes, and were able to spot a faint climbers trail, contouring under the southwest ridge, just below the prominent gully to our left (south). 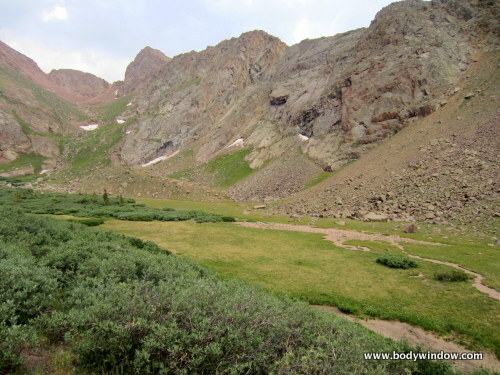 You do not have to drop all the way down to the high meadow, but start traversing at about 12,000 feet. We hopped down to this faint trail and it led us around the cliffs, now above us, toward the southwest and then the southeast. The faint trail lead us into the basin on the south side of Pigeon Peak and toward the saddle that leads to Turret Peak. 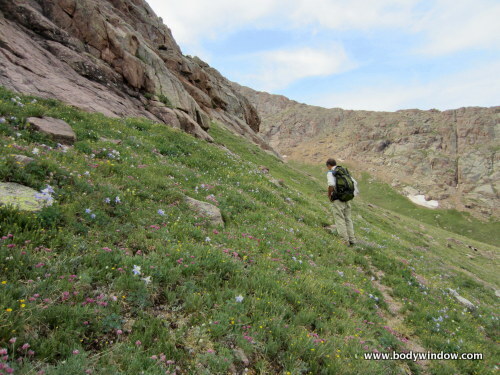 The grassy slope here was full of gorgeous wildflowers! I wanted to stay for awhile. We breathed deeply and relaxed on this more level terrain. 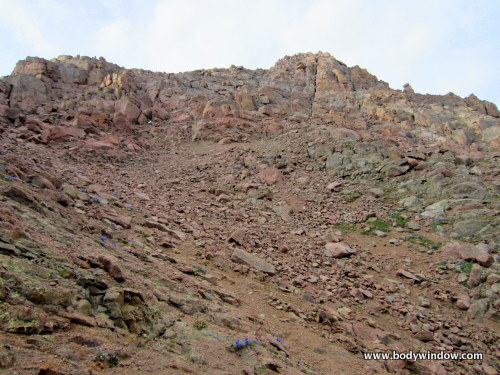 As we rounded the southwest ridge, the next destination, the saddle at 12,780 feet came into view. It is the saddle on the left, in the picture below. The trail quickly faded, and we picked our way through what we thought was the path of least resistance. This basin is filled with rubble and it was tortuous to make our way through it. 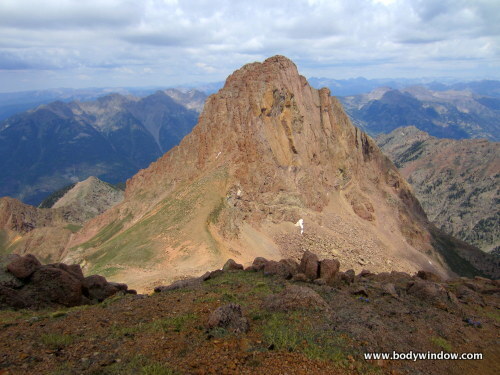 Once reaching the 12,780 foot saddle, Turret Peak comes into full view! 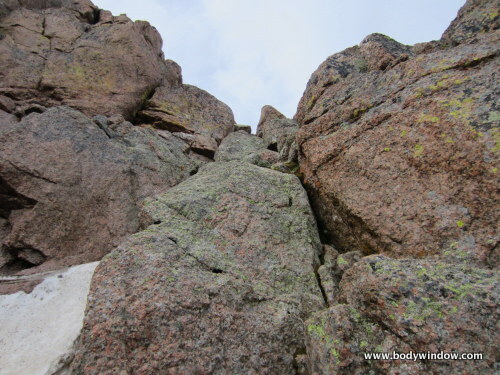 You do not need to climb to the top of the Pigeon-Turret saddle, to the high left, but make an ascending traverse, just to the left of the rocky outcropping, that you see below in the picture. When you first leave the saddle, stay high and to your left, and follow some cairns to avoid losing any elevation. Then cross over several gullies as you keep the grassy northwest slopes of Turret Peak in your sight! In this picture, below, we have crossed the gullies and are above the rocky outcropping, with just the northwest grassy slopes ahead. 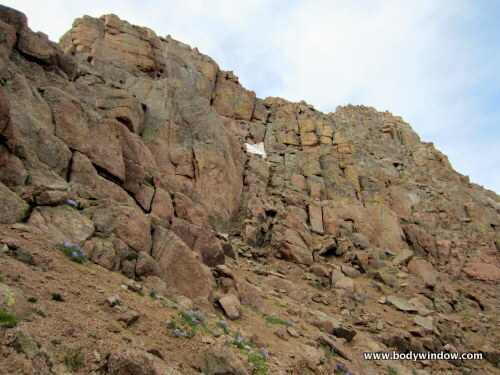 As you look up, head east and aim for the next mounded rock outcropping to your left (north). This is where the grassy slopes end, and the route takes a turn to the northeast. 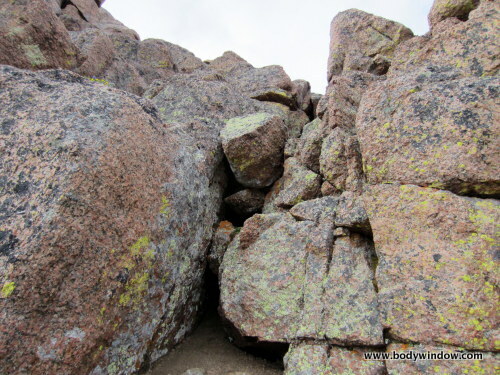 Below is a close up of the mounded rock pile that you need to aim for as you are climbing. There is a faint climber's trail here in the sandy soil. The northwest ridge of Turret Peak is seen in the picture below. 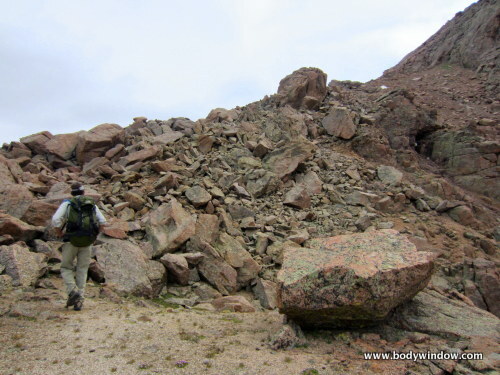 It looks like a pile of rubble, but it is easy to pick your way through this, looking to attain the top of the ridge. At the top of the northwest ridge, the trail seems to come to an end. When the sandy trail ends, look for this V-slot, as Roach calls it. 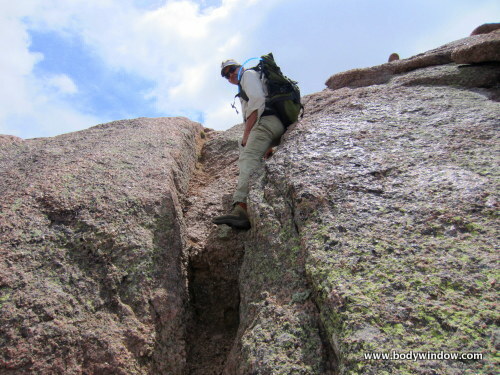 It is much easier than it looks, and is only an easy scramble in this crack. Here is the upper end of the V-slot. You can see that it is easy to negotiate this clever passageway! 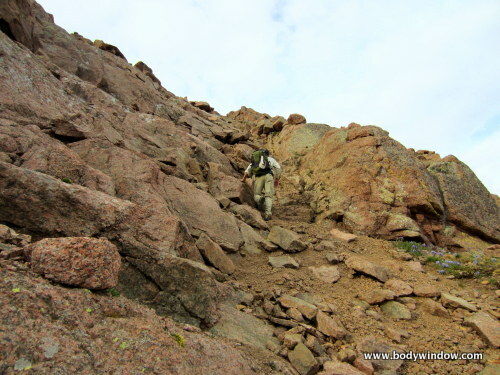 The rest of the way to the summit is by an easy, but steep trail, that is very easy to find. 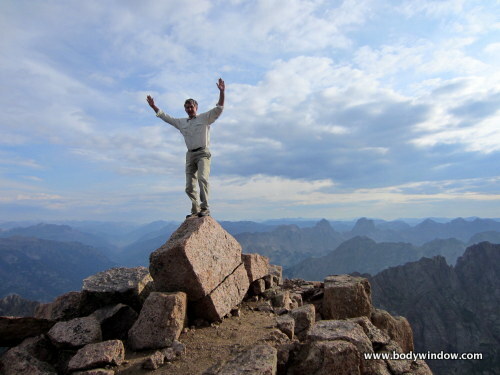 Here I am on Turret Peak, at 13,835 feet, looking to the southwest at Windom Peak, Sunlight Peak and Mt. Eolus. Jupiter Mountain has all but faded from view. Centennial Peak number 99 completed! From the summit of Pigeon Peak to the summit of Turret Peak took us three hours, to do the two miles and another 1835 feet of elevation gain. We reached the summit at 11:15 a.m. The clouds were starting to build, but we still relaxed and enjoyed our summit experience for another half an hour. Again, the views from the summit were stupendous. 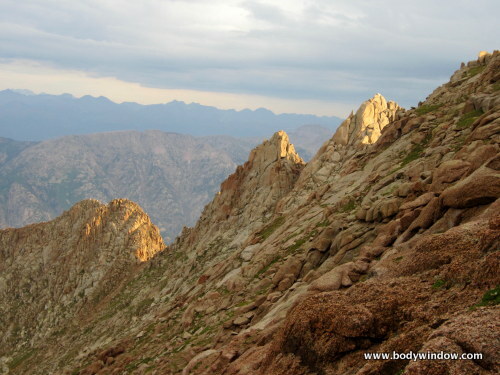 The views of Pigeon Peak as you ascend Turret Peak are breathtaking. The sun came out on Pigeon Peak, below and made for a dramatic picture! Perfect timing - thank you, sun! Yet another hour and 15 minutes, and 1.5 steeply descending miles and we were back in the high meadow where we camped at 11,740 feet. Even though it was only 1:00 p.m. we chose to spend another night in this idyllic camp. And we were so glad we did, because the heavens proceeded to open and hail and send torrential rain on us later in the afternoon. This would have been a murderous slide down the North Pigeon Creek drainage in the hail and rain! On day three, we woke early, and set off for the long descent back to the Needleton train stop. Our return trip only took us 2 hours, to go the 3.14 miles. With clear skies, and the GPS to back-track us out, there were no route finding difficulties. We arrived at the Needleton train stop, two hours before its 11:15 departure. 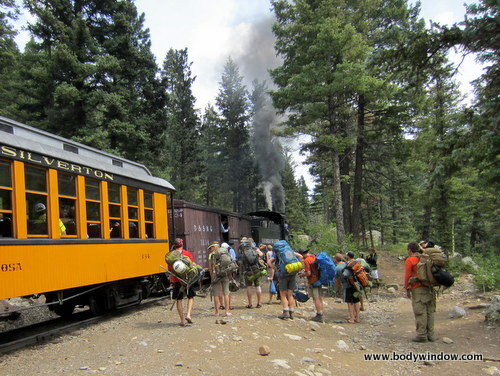 As you can see, the crowd of backpackers boarding the train at the trailhead was significant. And we saw nary a one on our wilderness trek! All-in-all the round trip, my GPS clocked at 11.5 miles, several more miles that Gerry Roach's guide book, Colorado's Thirteeners and a total elevation gain of 7200 feet. It was the steepest and hardest route finding challenge that we had done so far. 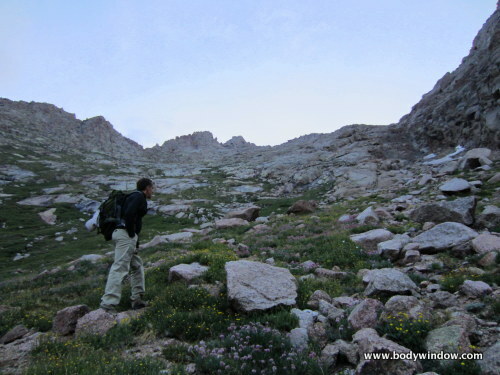 The trail to the high meadow at 11,740 was relentlessly steep. Route finding was a real challenge. Yet the trip was one of the most rewarding. 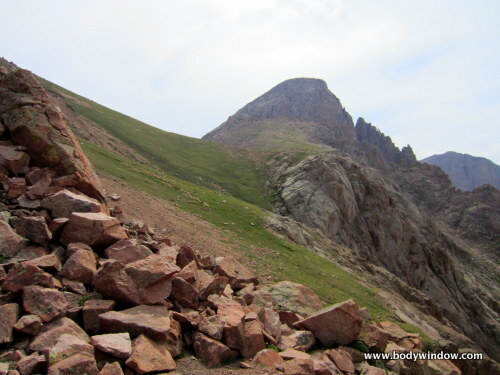 Pigeon Peak and Turret Peak are mighty peaks in the Colorado mountains. I was depressed for days, after the trip, longing to go back to that high, idyllic meadow, where the mountain goats kicked down rocks from the cliffs above, the sun threw the alpenglow on the high peaks, and the marmots and pica scream their warning to one another that we were in their turf. Nothing is more healing, nothing makes me more aware of myself, and nothing brings me closer to Presence than a trip into the wilderness. The healing of my body-mind-soul was complete! *** Please note that the numbers and figures in this article are for guiding purposes only. They are not definitive. 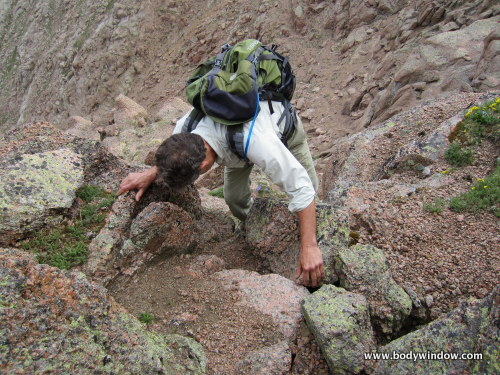 You are responsible for your own route finding and mountain climbing efforts. The Body Window is not responsible for your safety in any way. Mountain climbing is a risky sport!